You will use the chain stitch, one way or another, in every project that you make. It is really the most basic stitch in crocheting. It's simple and can be used in many different ways. There's two skills you'll need first, a slip knot and the yarn over. Let's cover those first. There needs to be a starting stitch on your hook and that's what the slip knot is. There are many ways to make this knot. Here's the technique I use. 1. I weave the yarn around my fingers first. You don’t have to start this way, though, but I think it’s easier once you get the hang of it. 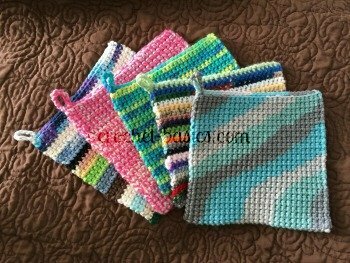 Plus, the yarn will already be on your hand and you’ll be ready to start crocheting. Remember to leave about a 4 inch tail and hold the tail between your thumb and middle finger. Your index finger tightens up the yarn, that's how you control the tension. 2. Pick up the tail of the yarn with your right hand. Hold it with your thumb and index finger. 3. Lift the yarn in between your two hands with your right middle finger. 4. Now turn your hand, laying the yarn in your right hand over the yarn that’s between your thumb and middle finger of your left hand, making a loop. 5. Hold the base of the loop with the thumb and middle fingers of your left hand. The tail should be looped over the top. This is what your loop should look like with the right side over the top of the left. 6. Bring your crochet hook through the back of the loop. 7. With the hook facing up, bring the yarn over the top of the hook from the back . . .
. . . twist the hook forward (toward you) over the yarn, until the hook is facing down. This twisting hooks the yarn and makes it easier to draw back through the loops. This is called a yarn over. In patterns its abbreviation is yo and that’s how I’ll refer to it from now on. 8. Now pull the yarn through the loop in your fingers. 9. Loosen your hold (thumb and middle finger) until you are just holding the tail of the yarn. 10. 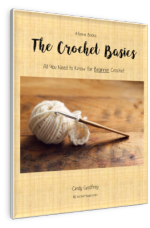 Pull up with your crochet hook to tighten your slip knot. The loop on your hook is probably too big now. Pull back slightly with your left hand to tighten the loop. Don’t make it too tight. Be sure your hook can still slide easily through the loop. Practice making this knot. You’ll use it over and over again. You want it to become second nature to you. If you take your crochet hook out of the loop, you can simply pull on the yarn and the knot comes right out. That’s why it’s called a slip knot. If it doesn’t come right out, then the knot wasn’t done properly. The chain stitch makes the foundation of most every project. 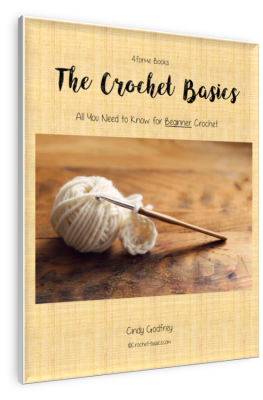 It’s at the top of the list of crochet basics. But it’s super easy! The abbreviation in patterns for chain stitch is ch. Starting with your slip knot on the hook, yo (yarn over) and pull the yarn back through the loop on your hook. Just like you did to make your slip knot earlier. That is a chain stitch. I told you it was easy! Continue this step to make the chain as long as you want. Practice making different lengths of chain until you can consistently make nice, even chains. This is how your chain stitches should look from the front and from the back. Patterns will tell you how many chain stitches you need by saying “chain 4” or “chain 100”. You can clearly see each stitch on your chain and they should be easy to count. Never count the loop on your hook. It’s not a stitch yet! Your stitches should be neat, not too loose, and not too tight. Hold the yarn firmly in your fingers, but allow it to glide. It should slide easily through your fingers as you make your stitches. Your thumb and middle finger should always be holding your chain just below the crochet hook. Make a couple of stitches and then adjust your hold so it is back up under the hook. This adds tension and helps keep your stitches uniform. If you let it get saggy, it will make it very difficult to crochet, if not impossible. Your yarn should make a nice, straight line from your index finger to where your thumb and middle fingers are holding the loop. No sagging. You’re off to a great start! Build on your chain stitch now by learning the Slip Stitch.